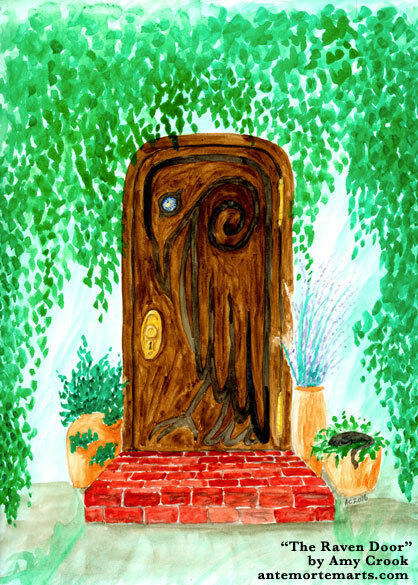 Loose watercolors render this dark wood door beautifully against the pale green wall, surrounded by a fall of ivy and profusion of potted plants. Rich red brick and warm terra cotta invites one to step up and knock, to peer through the raven’s eye and see what’s inside. 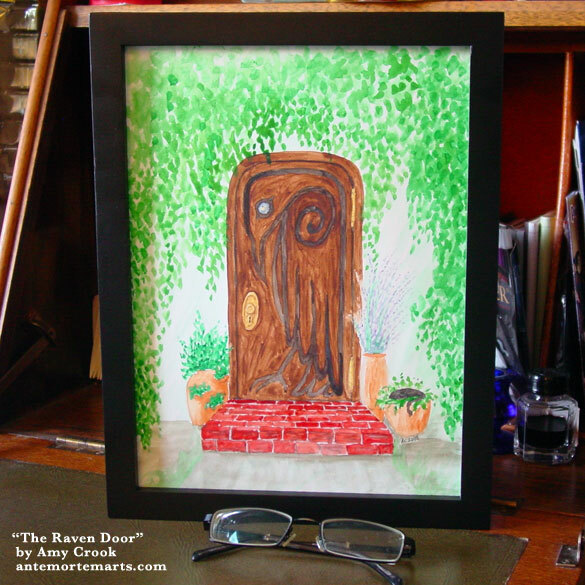 Who do you think lives behind the raven door? 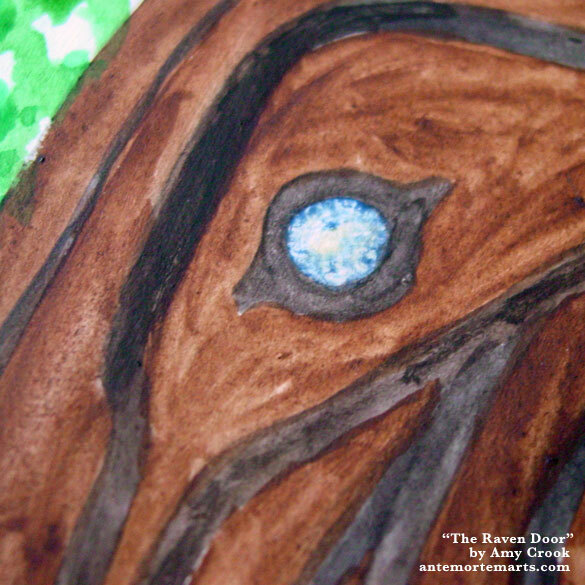 Above, you can see the lovely mottled-glass peephole that makes up the raven’s eye. 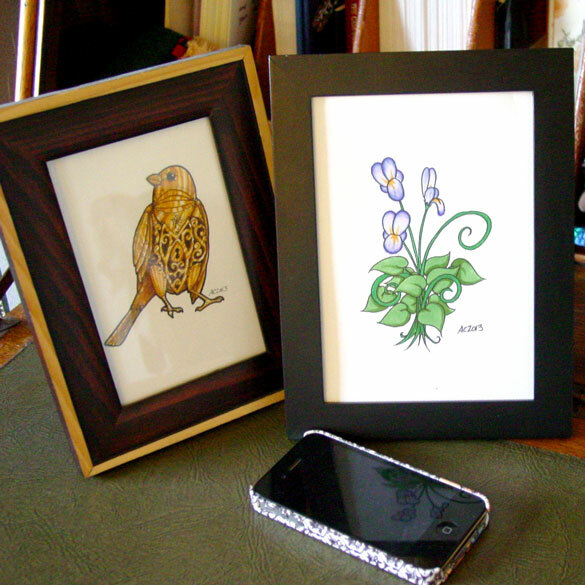 Below, you can see this larger watercolor in its frame, waiting to add a breath of green goodness to any space. I’ve been working hard on a new novel, Unboxed, which should be out sometime this summer. There’s a theme of keys and locks in it, and this lovely painting is part of the cover art. 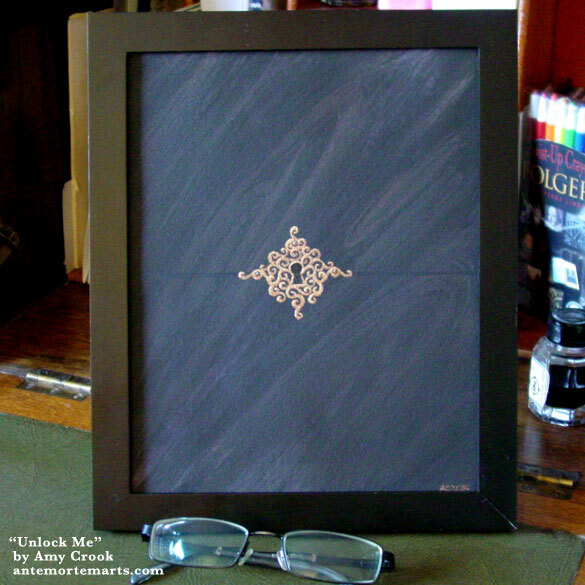 Lovely hand-painted filigree in a warm rosy gold frames a mysterious keyhole, just waiting for the right key to come unlock it. There’s 3 painted gemstones held in the spirals and curls of the metal. The background is a dark brown woodgrain, the opening of this mysterious box kept safe and sound by the lock that covers it. 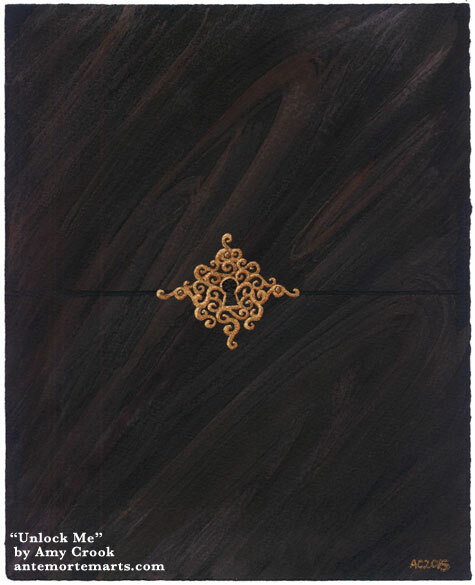 This painting gives a fairytale sense of mystery, inviting speculation and storytelling of your own to explain the reason for the lock, who has the key, and what hides inside. 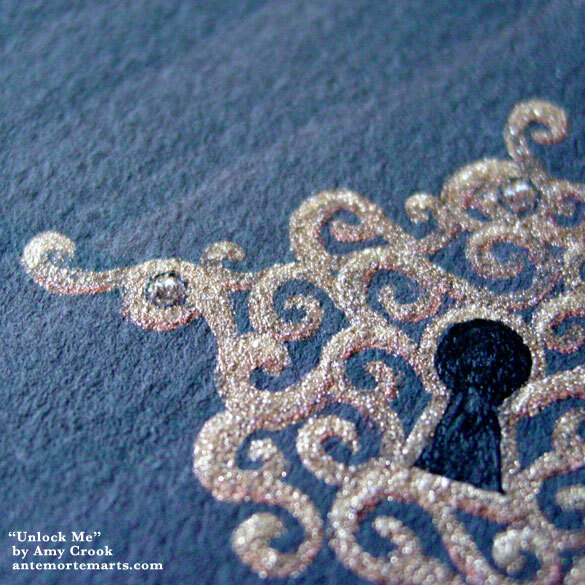 Unlock Me, 8″x10″ Japanese and metallic watercolor on Arches cover black paper. Above, you can see the painting washed with sunlight, catching on the gold and copper paint that make up the filigree design. Below, the painting sits in a frame, a fairytale just waiting to be told. 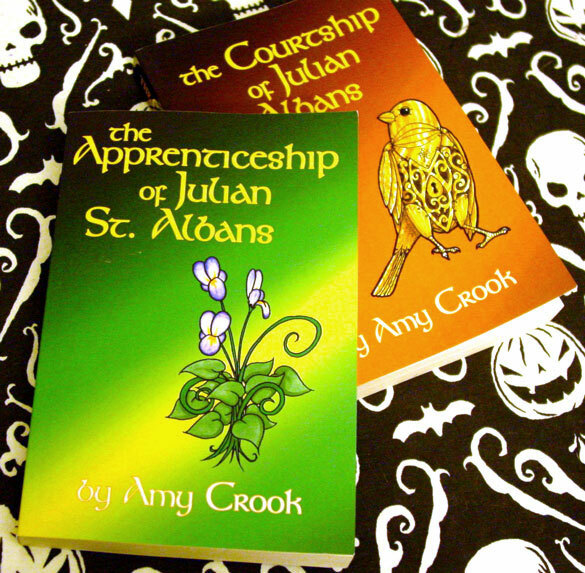 I finished my first draft of the sequel, The Apprenticeship of Julian St. Albans, and to celebrate I’m putting The Courtship of Julian St. Albans on sale for a week! Assuming all the Amazon Kindle magic has worked properly, the ebook version should be $1.99 for a week — and it’ll show a countdown so you know how long it’s on sale. I’ve also set it up so that if you buy the physical book, you can get the ebook for only a dollar more through more Amazon magic. Right now that’s the only place the book is available, I think, though I tickied some boxes the other day that might make physical copies available to your local bookstore, which is a little bit awesome. Our week of the Floating Gallery is almost over! It closes Sunday night, and all the art floats away, leaving me to relax and enjoy my holiday season. 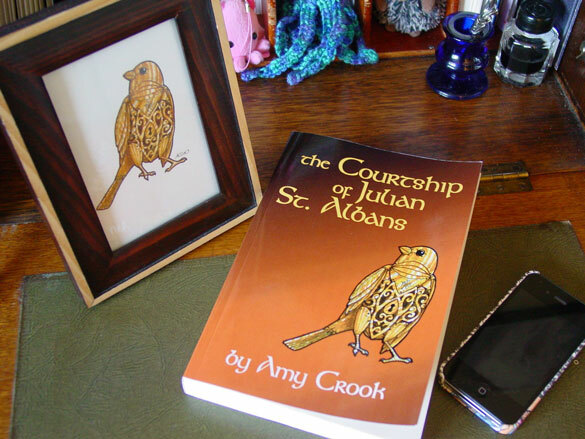 As part of my long month of working on the sequel to The Courtship of Julian St. Albans, I decided to do an illustration for the cover. There’s a lot of plants in the second book, but the fairy flowers feature in both of them, and I wanted to give a visual to them. 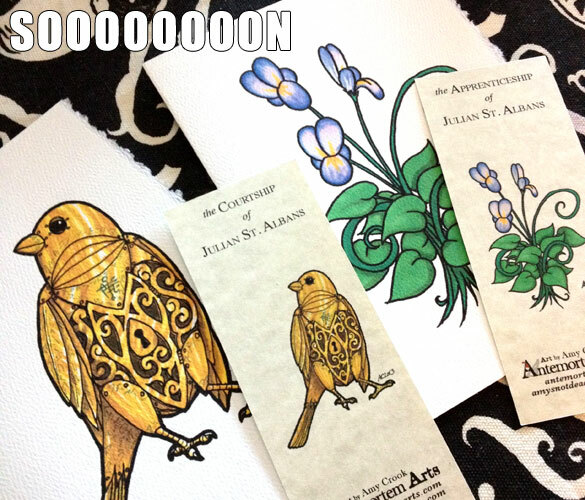 They’re described as a common flower, so I wanted something that reminded me of the wildflowers I picked as a kid, but that had a bit of magical whimsy to them. You can just imagine the butterfly fairies that are attracted to these little blossoms, giving luck to your home as a reward for letting them grow. 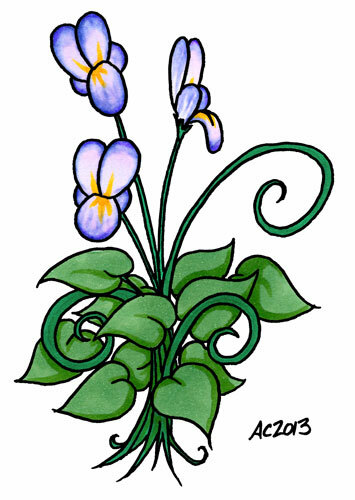 Fairy Flowers, 5″x7″ pen & ink and Copic marker on paper. 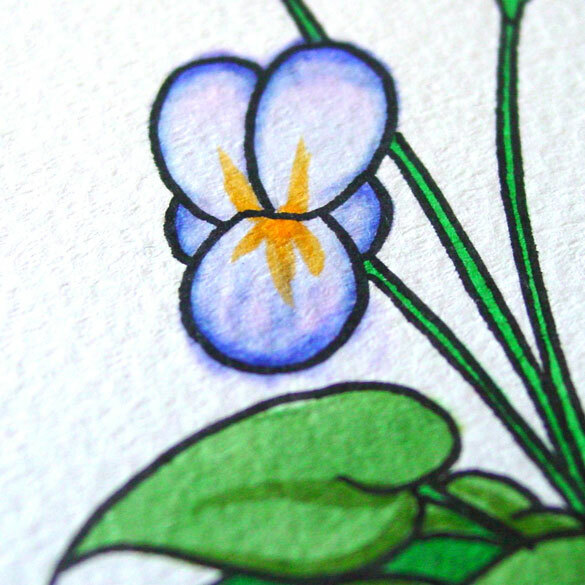 Above, you can see a close-up of the flower’s five fat little petals, and the way the purple ink wanted to bleed out past the lines. Tricksy blending. Below, you can see the piece in a frame with Horace, the bird from the cover of the first book.